by history buffs, the governor's office and FEMA. Warren Lee considers Sand Island Lighthouse a childhood friend. The Mobile native remembers trips he took to Sand Island and its lighthouse with his father. As an adult, Lee continued to see the beacon during fishing trips. Gradually, he began to investigate who owned the historic, ailing structure and why it was being neglected. Since then, Lee has teamed up with other lighthouse enthusiasts and preservationists and joined the Alabama Lighthouse Association. The group has encouraged the Town of Dauphin Island's involvement, and together they have directed Federal Emergency Management Agency money toward stabilization. Now they have a plan to restore the historic lighthouse and turn it into a tourist and family attraction at the mouth of Mobile Bay. First, some history about Sand Island Lighthouse, courtesy of an intensive study done by Thompson Engineering Inc. of Mobile. The 126-foot lighthouse was completed in 1873, making it the fourth structure to serve as an entrance to Mobile Bay. The more rudimentary lighthouses of 1830 and 1838 were followed with a 150-foot lighthouse build in 1858. During the Civil War, union troops controlled the lighthouses, transforming them from navigational beacons to threats to the Confederate side. 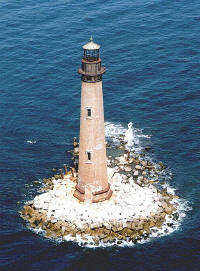 Confederate troops eliminated this strategic advantage by destroying the sand Island Lighthouse in 1861, a tactic that sent 160 other Gulf coast lighthouses to ruin. After the war, the foundation of the 1873 lighthouse was made of interconnected wood pilings with an overlay of 12 feet of concrete. The 28-foot diameter base is made of bricks, and it is nearly six-feet thick at the foundation, according to the report. Over the years, the lighthouse has been victim of two damaging forces of nature - coastal erosion and weathering. The coastal erosion causes an east-to-west drifting of sand, moving sand away from the lighthouse. Meanwhile, the tides between the Bay and the Gulf move sediments toward the mouth of the Bay. Since Sand Island is part of the outer bar at the mouth of the Bay, the island's sands are unstable and constantly refigured by currents and tropical storms. As it fights coastal erosion, the lighthouse also has had to battle the effects of weathering - the salt spray, blowing sand and wave action that have corroded its iron stairs and mortar. From 1873 until 1933, the Sand Island Lighthouse was a functional, working navigational tool along the Gulf Coast. That year, the Coast Guard deactivated the lighthouse. When Lee began looking into revitalizing the lighthouse, he met with retired U.S. Navy Capt. Hal Pierce and others who were interested in Middle Bay Lighthouse and Sand Island. Together, they organized their efforts on behalf of all local lighthouses into the Alabama Lighthouse Association. Two other lighthouses have the association's attention: Middle Bay Lighthouse in the middle of Mobile Bay and the Mobile Point Lighthouse on Fort Morgan, across the mouth of the bay from the Sand Island Lighthouse, in Baldwin County. "It's a big effort, and it's an important effort," Pierce says of the group. Before they could work on the Sand Island Lighthouse, they needed to ask the General Services Administration to transfer ownership of the lighthouse from the federal government to the Town of Dauphin Island, which occurred in November 2003. Dauphin Island, in close contact with the Alabama Lighthouse Association, contracted with Thompson Engineering Inc. to study the feasibility of restoring the lighthouse. In order to complete the study, Dauphin Island used a $50,000 grant from the governor's office, as well as funds of $12,500 raised by the Alabama Lighthouse Association. Pierce, Lee and other members of the Alabama Lighthouse Association say that Thompson Engineering's study was much more detailed than they ever would have hoped and far exceeded what they paid. Thompson decided to turn the Sand Island Lighthouse study into a community donation and cause. Spurred on by Jack Granade at Thompson, the company studied the problems of the lighthouse and offered suggestions to Dauphin Island and the association in 2007. "This is our Statue of Liberty," Granade says. "And we have a wonderful opportunity here. It was a 400-acre island at one time, and is now down to a pile of rocks." Since the stability of Sand Island Lighthouse was compromised by recent hurricanes in the Gulf, FEMA money was used to shore up the tower and prevent further deterioration. The $1.2 million FEMA project - which included sealing vertical cracks, repairing cast iron rings, replacing bricks, reattaching copper roof panels and stabilizing the rocks - was started this summer and completed this fall. The Thompson plan also included a ling-term restoration plan for the lighthouse and island, which would promote tourism. That plan calls for building on the completed emergency measures and stabilizing the tower. It also would include protecting and enhancing the island with a sandy beach and a protected spot for anchored boats. Depending on the level of enhancements to the island, the Thompson study estimates this could cost between $15.9 million and $36 million. "There are long-term benefits from tourism and eco-tourism effects of this project," says Dauphin Island Mayor Jeff Collier. "We are excited to be part of this process. We don't know how long it's going to take, but you can't get here if you don't start." Now that the FEMA stabilization has been completed, Lee says the group will meet to discuss the next steps, dividing the Thompson plan into parts that can be completed as they raise funds over the years. "now that our end goals are defined, we're going to divide it up into manageable pieces, attainable goals." Jim Hall, a board member of the Alabama Lighthouse Association, says the Sand Island Lighthouse is an important symbol for the area. "It's an image that shows the value of maritime history. Something as majestic as the lighthouse, and it's still here." For more information about Sand Island Lighthouse, visit the Alabama Lighthouse Association's Web site at: www.alabamalighthouses.com.